I’ve been hankering for some good ol’ Malaysian curries lately. I think it’s because I’ve had about 3 people ask me for a recipe for a good Malaysian curry chicken. 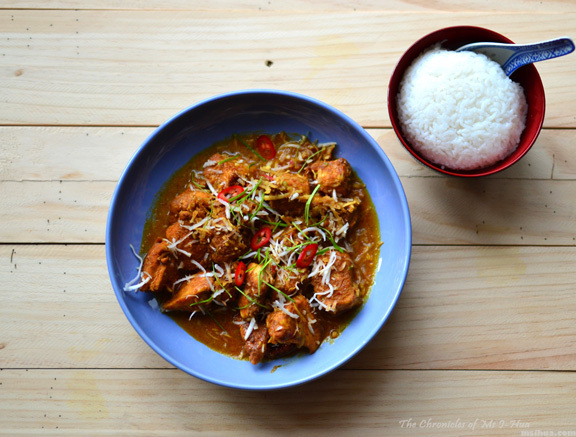 I always point people to Amy Beh’s recipe (Spicy Curry Chicken, Nyonya Curry Chicken, Chicken Curry Chinese Style) but it does take a lot of energy (not to mention ingredients) to make. Being a lazy cook and all that, I couldn’t find the energy to want to mortar and pestle it out with all the spice pastes and mixes. I also had none of the required ingredients (shocking) in my pantry for any of the curries listed above. Which got me thinking! I am Malaysian! I’ll make one up by hook or by crook and it will be made by a Malaysian and thus will still qualify as a Malaysian Curry Chicken! With that logic in mind, I tackled what ingredients I did have in the kitchen with my wooden spatula. What I discovered, was that good tasting curries need not be overcomplicated. Just a few simple spices and voila! Happy days. *Note – to get the coconut water, simply soak the desiccated coconut in warm water and squeeze. Repeat this a few times making sure that the coconut is completely dry before you toast it. Save the water to be used in cooking. Alternatively you can mix 1/2 cup of coconut milk with 1/2 cup of water. Coat the chicken pieces in the curry powder and salt and set aside. In a hot wok (or frying pan), heat up 4 tablespoons of vegetable oil. Once the oil is hot enough, brown the chicken in the wok on all sides. Take out and set aside. Using the same oil, toss in the chopped garlic, dried red chillies and sambal olek. Once the aroma starts wafting up, gently pour some coconut water into the wok letting it simmer gently. Add in the Worcestershire sauce, fish sauce, sugar and ground white pepper and let simmer. Turn the heat back up on high and toss the browned chicken back into the simmer sauce and give it a good mix. Add in half a cup of the toasted coconut making sure to mix all ingredients in the wok as to coat everything. As the sauce thickens up, add in the remaining coconut water and let it simmer gently. Once the sauce thickens up again, turn off the heat and plate up. Garnish with the remaining toasted coconut, shredded kaffir lime leaf and sliced red chillies. 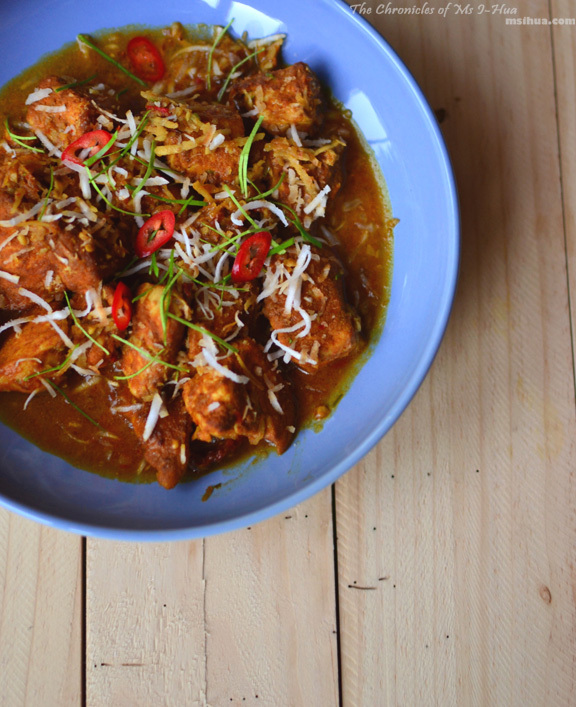 Serve with a heaped bowl of coconut rice (Nasi Lemak). We had ours with fried egg, sliced cucumber and store bought ikan bilis and peanut mix. Are you talking to me? Am I really good looking? Yarrrrm! Happy days indeed. Want. super love chicken curry 😀 also perfect for winter, since it’s coming up brrrr! This doesn’t sound like cheating- it sounds delicious! Ashley recently posted…Meatball and Wine Bar – Breakfast! Yup! 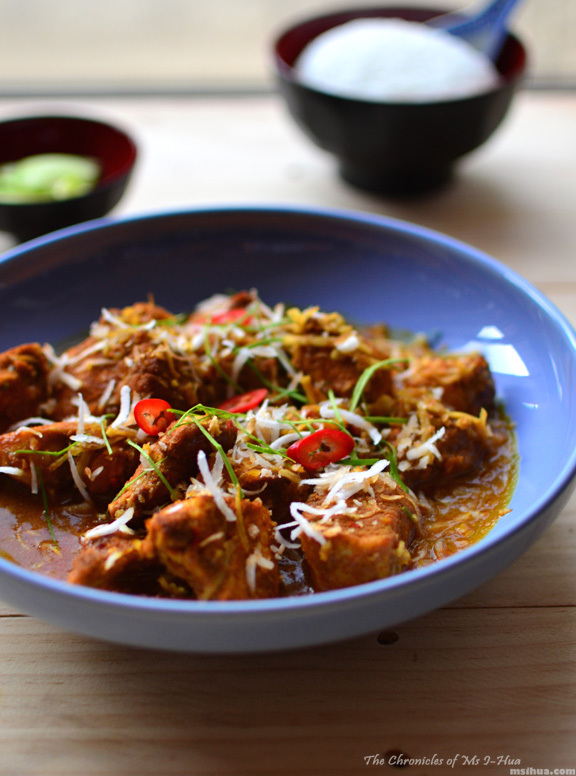 Curries are best in the winter months! That means any recipe I cook is automatically a convict recipe! BOOYAH! It’s so easy I don’t know why I didn’t do it before! You call this lazy?? You’re still cooking at home and making curry 🙂 That’s not lazy! It is too! The real thing has like a gazillion ingredients! Haha I like your Malaysian logic, and this is very resourceful of you! Uhuh! Technically anything I cook is now Malaysian with this logic 🙂 I’m amazing! Celebrate Valentine’s Day with some Red Velvet Cake Doughnuts!